I haven’t updated my pulmonary rehab for a little while, so now is the time. I’ll be writing this while watching the PHILADELPHIA FLYERS / OTTAWA SENATORS hockey game, so if I accidentally type score, it is simply because I am too excited by the game. 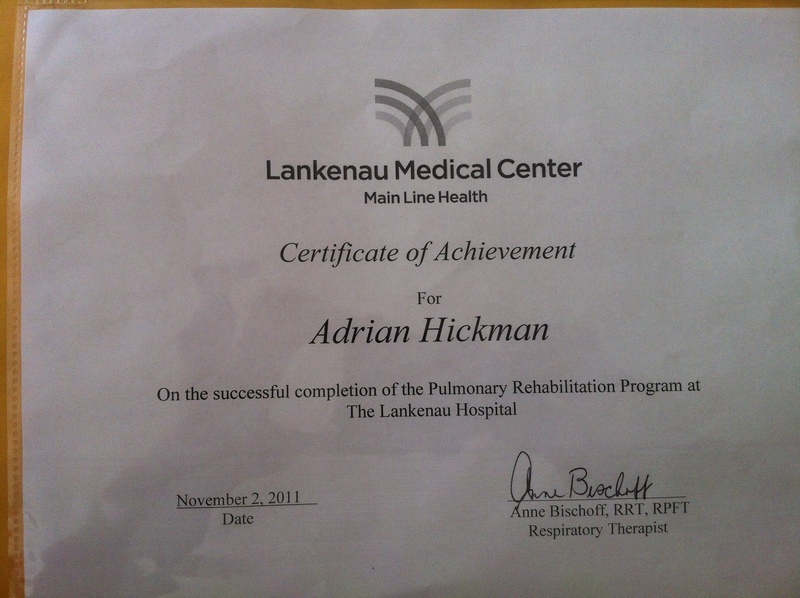 I am now two weeks ( 6 sessions ) away from the end of my pulmonary rehab sessions/workouts at Lankenau Hospital. These are limited by health insurance. I was among the lucky ones, if you can call it lucky, because 36 seems to be the highest any insurance plan will pay for. BTW, those 36 sessions are for a LIFETIME, not just for a year or two. Therefore, I better get the most out of it now, because I won’t have access to this valuable program again. I will be following it up with a pulmonary maintenance rehab program at Bryn Mawr Hospital. This is essentially a gym setting. 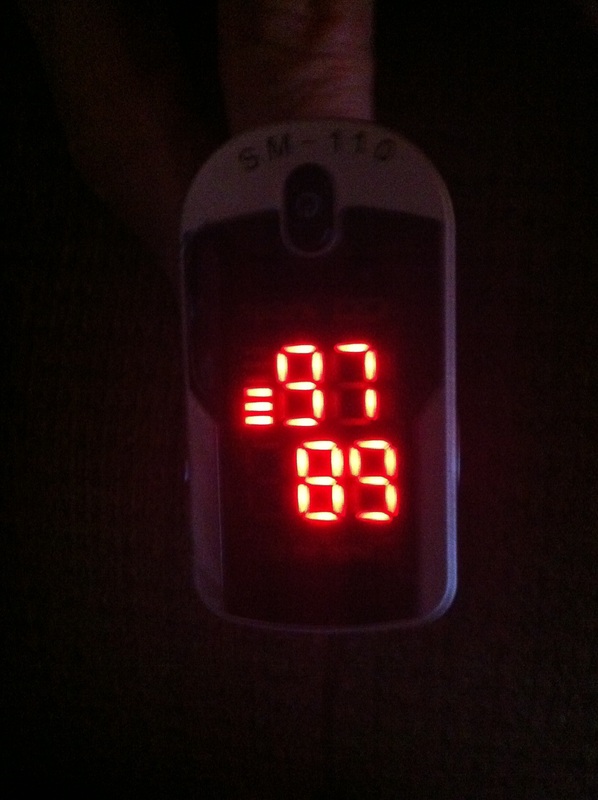 The major difference is that I won’t have a therapist to work with me, nor any monitoring equipment to gauge levels like BP, pulse rate, heart rate, or blood oxygen levels. Of course, I could collapse and then get to use the hospital equipment. Or, I could simply use my best judgement and understand what my body tells me. After all, when I go for a walk or try to go out, I won’t have the monitors there, either. This will have the treadmill, hand weights, UBE arm machine and aerobic bikes to use, with a central oxygen concentrator so that I won’t use up my tank supply. I’ll be all buff and styling, but in a less obvious setting. With two weeks to go, I have finally hit our main goal of a mile on the treadmill. That sounds like nothing to the average person, but trust me, it is tremendous for me. 10 weeks ago, I started at 3 minutes at a 1/MPH speed, no incline. The last visit, I did 26 minutes at 2/MPH with a 1.5% grade. That just gets me to about one mile. Wednesday, we will increase to 2.4/MPH. Trust me, the effort levels and breathing ability can be a little tough, but determination goes a long way to making it work. I have also improved on the UBE arm machine, up to a 10 minute session, 4 minutes backwards. 12 minutes on the bike at 50 watts, and 6 lb hand weights in each arm for 8 minutes (a set of 7 exercises). In two weeks, I actually get a diploma. A very special diploma. It means I can still accomplish something. And like every diploma, it will be a very melancholy occasion, and I might cry. These 12 weeks have been important and moving for me. I will always cherish them as much as any school graduate cherishes their own. And I will miss my therapist, Anne. It sounds like a cliché, but you always want someone to supervise you in these things, someone who will not allow you to complain. Not quite a drill sergeant, but a person who knows what you can do and accepts nothing less, and sometimes expects a little more. We had a brief seminar after the workout. These things are always informative. However, unlike the exercise, which always has you active and moving, this is more passive. We verbally participate, but as with any class, this is to learn things that are important for the future. Unfortunately, these also serve to remind you of the cold hard fact that things will never get better. We talked about the ways to exercise at home and after the rehab sessions are over. These exercises are to give you the best chance of slowing the progression of your disease. However, they don’t stop it, reverse it, or sprinkle it with pixie dust to make it go away. It is what it is, and they will help you to best enjoy each day as it comes. The final ironic moment was when Anne asked me if I bowled. Well, I did (badly) and the night before, I was thinking of asking her about bowling again, since my organized sports activities are limited. 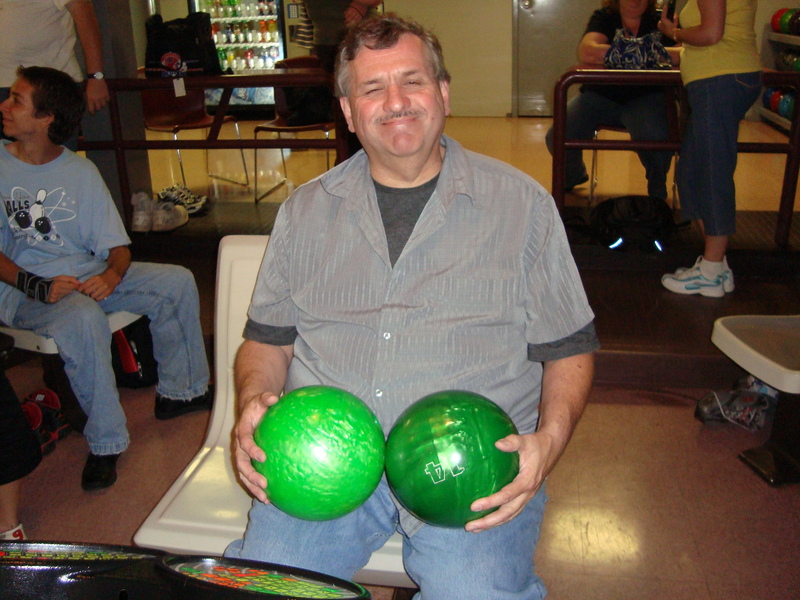 Bowling works for me, and I will try to bowl soon (badly). Anne recommends that I bowl, since it is good aerobic exercise, though I may have to use a lighter ball than I am used to, and not two at a time like in the silly picture. Finally, as I’ve mentioned previously, I have found support groups for my type of Interstitial Lung Disease (and similar ones) very hard to come by. They may be out there, but most of the support out there focuses on the more well known pulmonary issues. So, I am going to try it on my own. 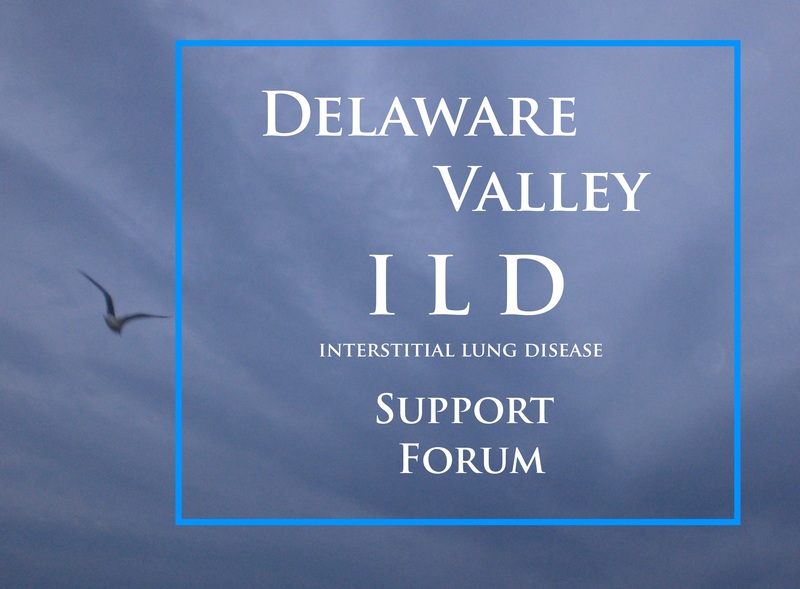 To feel my way around, I have set up a FACEBOOK page, open to all, called DELAWARE VALLEY INTERSTITIAL LUNG DISEASE SUPPORT FORUM. While I would love help and advice from the local chapter of the American Lung Association, this is my beginning to reach out and help others find people to talk with and share with. It is not a medical site nor is it there to endorse treatments. It is simply to help each other through today, tomorrow, and every day going forward. The link is Delaware Valley Interstitial Lung Disease Support Group . It is an open group. Friends and relatives are also invited to participate. The more support, the more we get out of it. Note: At the end of this post are links to previous posts about my lung disease. I’ll keep these links at the end of each subsequent post or figure out how to add a Table Of Contents. I still haven’t come up with a better word for those who read this blog and those who follow and talk with me on Twitter and Facebook, so I’ll call you friends. Friends, I can use your suggestions and input. As with any task or project, my progression through the various needs, causes, and individual outcomes of my efforts to live with my Interstitial Lung Disease gets to be much less simple and much more involving than I sometimes think it will be. As I try to get this blog going, the outcome of it remains to fulfill the need for a creative outlet, absent of being able to create in a work environment. The blog also requires a social element, people to watch you “run it up the flagpole and see who salutes it”. Over the next few days, I am going to be trying to redesign it so that it is easier to navigate as well as more professional looking to both first-time visitors as well as returning friends. I can use your advice and guidance with that. In the meantime, I can also use your help with this. Recently, because of the seriousness of my illness, I was asked by one of the hospitals that I get treatment in to participate in a study. I’m not naming the hospital and will keep some things a bit sketchy, simply because it is a study and I do not want to taint any part of it. 1)	LIVING WILL is essentially for when you no longer can make or understand end-stage decisions. These are instructions that you decide in advance and usually are not overridden except for good cause. 2)	HEALTH CARE POWER OF ATTORNEY is a person who you assign to make those choices for you. The study is to test various versions of a form to help make those decisions. I do not know what all the forms look like, nor how many variations of the forms are in circulation. Backing up a bit, this was always something I’ve never concerned myself about. I never pictured myself in this position as a patient and never wanted to face the eventual possibility that it would come up with my loved ones. So, a Living Will blended with the concept of a Last Will and Testament in my mind , but they are two entirely different statements. A Last Will deals with WHAT you leave behind, while a LIVING WILL deals with WHO you leave behind. Wait just a doggone minute, you might say. A Living Will deals with your care when you cannot make those decisions any more, you might think. It concerns you, not your loved ones. Well, up until my dad’s passing this past January at age 87, I would have agreed with you. After all, it is about your care and comfort when you exhausted all treatments and all ability. And that it is, but as I read the materials and relate back to my Dad’s 7 week hospital stay, I realize that I am only looking at the surface. As my father’s condition worsened, my brothers and sisters still held out all hope and wanted all possible care for him. We just didn’t want to let him down, to seem like we abandoned him or gave up. However, as we discussed the status of my father as well as procedures that could be tried, we began to learn that even the most common procedures might only be stopgaps. 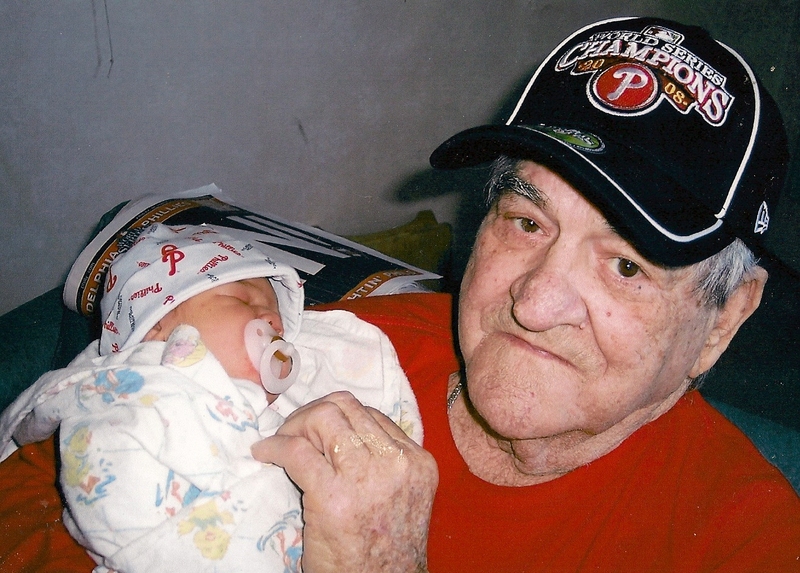 For example, when my Father could no longer eat or desire to eat, we had the doctors insert a feeding tube. We didn’t want to starve our Dad. That thought horrified us. However, as we learned, the body has a mind of its own. As his body wanted to shut down, it stopped absorbing protein. All that happened was that the liquid nutrients could no longer be sustenance and began to back up in his body, causing him to retain fluid and affecting his comfort and breathing. For the short term, the tube stopped being a nutrient and became a detriment to his last days. We finally made the decisions on his final care. At that point, we began to realize that the body has finite limits that we can try to affect but that eventually may be fruitless.Without any direction from my Dad, we were only making loving guesses. However, we also started to realize that the mind started to become more important. Both ours and my dads. Once we were faced with what was inevitable, we began to become a higher level of family. We could now get ready to say goodbye to our Dad in the way we would were he alert and simply going away for a while: We joked and reminisced. We gathered by his bedside. We shared our feelings and our joys. We allowed him to leave as part of the family, unencumbered by the bloops and bleeps of the medical maintenance machines. We allowed him to leave as his body wanted him to leave and he joyously allowed us to be a family and remember him for what he always will be. It was a terribly hard decision but it was a passionate and loving one. That is what I mean by describing a living will as for WHO you leave behind. You no longer burden them with the fear of the inevitable and with having to make decisions that are emotionally loving but may also seem heartless in any other stage of your health. And you allow them to go forward with their own lives without guilt or remorse over any decisions that they had to make, as well as with some very special and sweet final memories of you. So how can you help me with this? If you read all the way through, you already have. Just by granting me the chance to work my own thoughts out in this blog, you have helped. I still have to fill out the form as well as discuss it with my family, but my Father gave me the gift of his final days informing my future days and all that needs to be planned for, both wonderful and sobering. While he did not have a living will, I cannot help but feel that while he could not communicate, he was guiding what we did so that we would know what to do in the future. You can help further by commenting below with your thoughts or by contacting me on Facebook or Twitter. But most of all, you can help by simply continuing to read my blog and letting me know how I am doing. Like a living will, my blog is for you as much as for me. 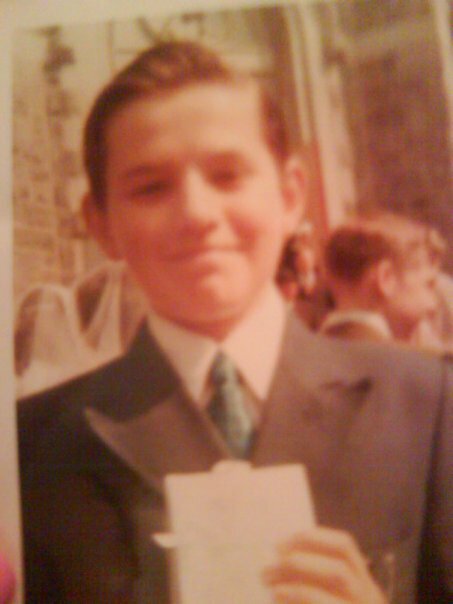 And you can say Hello to my Dad, Richard.